It’s just a small story really, about among other things: a girl, some words, an accordionist, some fanatical Germans, a Jewish fist-fighter, and quite a lot of thievery. . .
Set during World War II in Germany, Markus Zusak’s groundbreaking new novel is the story of Liesel Meminger, a foster girl living outside of Munich. Liesel scratches out a meager existence for herself by stealing when she encounters something she can’t resist–books. With the help of her accordion-playing foster father, she learns to read and shares her stolen books with her neighbors during bombing raids as well as with the Jewish man hidden in her basement before he is marched to Dachau. This is an unforgettable story about the ability of books to feed the soul. 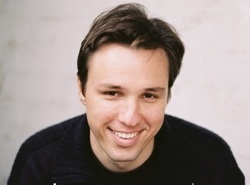 Australian author Markus Zusak grew up hearing stories about Nazi Germany, about the bombing of Munich and about Jews being marched through his mother’s small, German town. He always knew it was a story he wanted to tell. “We have these images of the straight-marching lines of boys and the ‘Heil Hitlers’ and this idea that everyone in Germany was in it together. But there still were rebellious children and people who didn’t follow the rules and people who hid Jews and other people in their houses. So there’s another side to Nazi Germany,” said Zusak in an interview with The Sydney Morning Herald. At the age of 30, Zusak has already asserted himself as one of today’s most innovative and poetic novelists. With the publication of The Book Thief, he is now being dubbed a ‘literary phenomenon’ by Australian and U.S. critics. Zusak is the award-winning author of four previous books for young adults: The Underdog, Fighting Ruben Wolfe, Getting the Girl, and I Am the Messenger, recipient of a 2006 Printz Honor for excellence in young adult literature. He lives in Sydney. Read more at the author's website. Discuss the symbolism of Death as the omniscient narrator of the novel. What are Death’s feelings for each victim? Describe Death’s attempt to resist Liesel. Death states, “I’m always finding humans at their best and worst. I see their ugly and their beauty, and I wonder how the same thing can be both.” (p. 491) What is ugly and beautiful about Liesel, Rosa and Hans Hubermann, Max Vandenburg, Rudy Steiner, and Mrs. Hermann? Why is Death haunted by humans? What is ironic about Liesel’s obsession with stealing books? Discuss other uses of irony in the novel. The Grave Digger’s Handbook is the first book Liesel steals. Why did she take the book? What is significant about the titles of the books she steals? Discuss why she hides The Grave Digger’s Handbook under her mattress. Describe Hans Hubermann’s reaction when he discovers the book. What does the act of book thievery teach Liesel about life and death? Explain Rudy’s reaction when he discovers that Liesel is a book thief. How does stealing books from the mayor’s house lead to a friendship with the mayor’s wife? Explain how Liesel’s own attempt to write a book saves her life. Liesel believes that Hans Hubermann’s eyes show kindness, and from the beginning she feels closer to him than to Rosa Hubermann. How does Hans gain Liesel’s love and trust? Debate whether Liesel is a substitute for Hans’s children, who have strayed from the family. Why is it so difficult for Rosa to demonstrate the same warmth toward Liesel? Discuss how Liesel’s relationship with Rosa changes by the end of the novel. Abandonment is a central theme in the novel. The reader knows that Liesel feels abandoned by her mother and by the death of her brother. How does she equate love with abandonment? At what point does she understand why she was abandoned by her mother? Who else abandons Liesel in the novel? Debate whether she was abandoned by circumstance or by the heart. Guilt is another recurring theme in the novel. Hans Hubermann’s life was spared in France during World War I, and Erik Vandenburg’s life was taken. Explain why Hans feels guilty about Erik’s death. Guilt is a powerful emotion that may cause a person to become unhappy and despondent. Discuss how Hans channels his guilt into helping others. Explain Max Vandenburg’s thought, “Living was living. The price was guilt and shame.” (p. 208) Why does he feel guilt and shame? Compare and contrast the lives of Liesel and Max Vandenburg. How does Max’s life give Liesel purpose? At what point do Liesel and Max become friends? Max gives Liesel a story called “The Standover Man” for her birthday. What is the significance of this story? Who are her climbing partners? What is her greatest obstacle? At what point does she reach the summit of her mountain? Describe her descent. What does she discover at the foot of her mountain? Hans Junior, a Nazi soldier, calls his dad a coward because he doesn’t belong to the Nazi Party. He feels that you are either for Hitler or against him. How does it take courage to oppose Hitler? There isn’t one coward in the Hubermann household. Discuss how they demonstrate courage throughout the novel. Describe Liesel’s friendship with Rudy. How does their friendship change and grow throughout the novel? Death says that Rudy doesn’t offer his friendship “for free.” (p. 51) What does Rudy want from Liesel? Why is it difficult for Liesel to love Rudy? Discuss why Liesel tells Mr. Steiner that she kissed Rudy’s dead body. ​How does Zusak use the literary device of foreshadowing to pull the reader into the story? Liesel Meminger lived to be an old woman. Death says that he would like to tell the book thief about beauty and brutality, but those are things that she had lived. How does her life represent beauty in the wake of brutality? Discuss how Zusak’s poetic writing style enhances the beauty of Liesel’s story. We had a Skype conversation with Markus Zusak as part of our One Book programming. Read about one participant's thoughts on her blog.